Facade retention scaffold design has many considerations. Ivik Masek BSc (Hons) IEng MICE, from design consultants 48.3, provides guidance on the design considerations associated with retention schemes while answering common questions. Raking, flying and dead shores are all types of retention systems. A raking shore consists of rakers (diagonal braces) that provide lateral support to walls. The ratio of bracing height to width at ground level is between 1:1 and 2:1. Flying or horizontal shores is a system used to restrain party walls or front and rear walls with proprietary scaffold beams. It is ‘flying’ because it does not bear on the ground. Dead shores are used to provide vertical support to roofs, walls or floors. A facade retention scaffold is similar to a raking shore because it provides lateral support to the facade of a building. These scaffolds are typically required when restoring listed buildings, improving the internal structure of a building or the stability of the facade has been compromised. 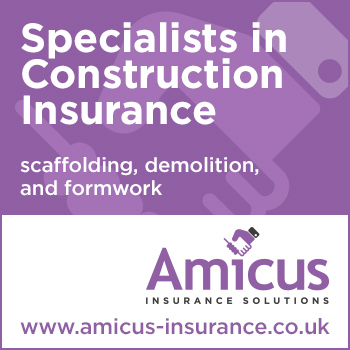 The scaffold is generally required from the start of the demolition/repair work until the completion of the new structure/repairs. It’s essential to establish the facade’s construction (brickwork/stonework) and current condition of all areas. The external walls of UK buildings constructed pre-1900 are likely to be of full loadbearing thickness. A wall’s condition can vary in areas due to long-term water intrusion causing wall ties to corrode or the timber to rot. First, understand how the facade is restrained, then attempt to replicate the pattern of restraint using scaffolding, e.g. lateral support points at floor locations. Ideally, the facade ties are fixed through the window opening to avoid drilling into or through the masonry. Timber scaffold boards or packing are often used to achieve good contact with the facade and prevent damage from the steel scaffold tubes. With listed buildings, the fabric of the building must be protected. CIRIA C579 lists contributory factors in failures of retained facades, some of which are directly related to the design of facade retention scaffolds. Lack of appreciation of the technical issues. 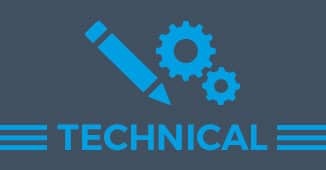 HSE Guidance Note GS 51 states that the design of any facade retention system will be carried out by a chartered civil or structural engineer who is experienced in and understands the type of work being undertaken. Inadequate investigation of the existing construction. Site visits are vital to better understanding the building. An internal and external visual inspection will help identify the general construction, fabric, floor locations and overall condition, which should be included in the design brief and form part of the design. Tying scaffolding for support to a facade. Consider the adequacy of connections between the facade and the scaffold retention structure. It’s also important to consider the possibility of local failure of the fabric between the scaffold ties. The scaffold needs to resist horizontal loading by wind. Consider the wall to be solid (worst case). See BS EN 1991-1-4 clause 7.4.1 (freestanding walls) or clause 7.2.2 (vertical walls of rectangular plan buildings). Additional horizontal load due to out-of-plumbness. Accidental impact loads. If a risk assessment identifies impact from demolition/construction activities as a risk, then the following impact loads must be considered: 10 kN from 1m above ground. 25 kN below (due to vehicle impact). See CIRIA C579 clause 8.5. Demolition sequence. Number of walls being demolished. Establish the sequence of work required to maintain stability. Rigidity & Stability. Factor of safety (FOS) 1.5 against overturning. FOS 2.0 against sliding. See CIRIA C579 clause 8.14. Assumed ground-bearing pressures. Weak soil under the kentledge can cause the scaffold to tilt and damage the facade. Depth of any basements, cellars or vaults. The additional depth will increase the lever arm when calculating overturning moments. Access requirements to the facade for repair works. 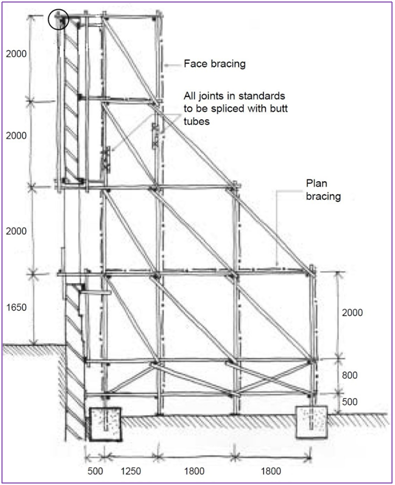 Joints in standards/uprights or bracing. All joints should be spliced to resist uplift/tensile forces. The site constraints will influence the proposed design solution. Limited space on-site can increase the kentledge requirements significantly. A simple solution such as taking up the parking bays can reduce the overall project costs. Site visits: most facade retentions schemes will require access to the interior of the building. If the condition of the structure is unknown, then safe access is not possible. Existing services should also be considered. Limiting the deflection will preserve the integrity of the retained structure. High limits on deflection results in very expensive scaffolds. Max. deflection limit of height(H)/750 with floor to floor limits of 5 mm over 3.0 m. e.g., the deflection limit for a retention structure 7.65 m high is 10.2 mm. CIRIA C579 stresses that there must be “ownership” of the scheme at all stages from inception to completion of the whole of the works. 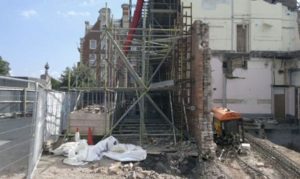 An early appointment recommended for facade retention work is that of a suitably qualified and experienced temporary works co-ordinator (TWC). All parties must be aware of their responsibilities under CDM Regulations, which stipulate that all relevant information about the site should be provided by the client. This guidance is intended as an aide to those seeking to design a basic facade retention scaffold. The reader is advised to refer to the CIRIA C579 guidance for further information. 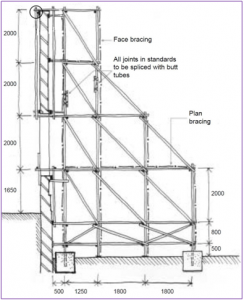 Facade retention scaffolds must be rigid structures, therefore additional material (i.e. transoms, ledgers, standards and bracing) will be required. Kentledge is often required and when supported on the scaffold can further increase the components needed. Furthermore, the designs typically require a BS 5975 Category 2 check, all of which contribute to the overall cost of a facade retention scheme. CIRIA (2003) Retention of masonry facades – best practice guide. CIRIA C579, London, Construction Industry Research and Information Association.